Every few years I go on a reading binge about Louisa May Alcott and it always ends with a trip to Orchard House in Concord, MA. This all began with the first book you see pictured, The Story of Louisa May Alcott by Joan Howard, given to me when I was around 10 by my Aunt Petty. It was actually several months before I would read it because I kept seeing the name “Louy” and thought the author was referring to a boy, not Louisa! Shows how much I knew. Once I got into the book, I was immediately captivated by Louisa’s spirit and life. I fancied myself a writer when I was a child, creating my own books complete with illustrations. I even gathered a group of friends together and put out a newspaper about our neighborhood. My father supported that effort by making copies of the pages at the office, and then I would assemble and staple them and deliver them to all the neighbors. Ultimately I was not to be a writer but I still very much identified with Louisa. As an adult, I began reading grown-up biographies, finding out that Louisa was a very complex woman (making her all that more interesting). Martha Saxton’s book, Louisa May: A Modern Biography, was a real eye opener. Here I found out for the first time about her ‘vortex’, her ‘blood and thunder’ stories, and the terrible emotional, mental and physical struggles she went through. After Saxton’s book came Madelon Bedell’s The Alcotts. This one fell into my lap. I was working for my hometown newspaper as a typesetter and a promotional copy of Bedell’s book arrived at the office. I persuaded the writer who received the book to let me have it. I was so excited when I got this book because of all the terrific pictures (still one of the best collections around in a book, I think). The book was very scholarly and covered mostly Bronson and Abby with promises of a second volume that would focus on more Louisa. Sadly that book never came about because Bedell died of cancer before she could finish it. 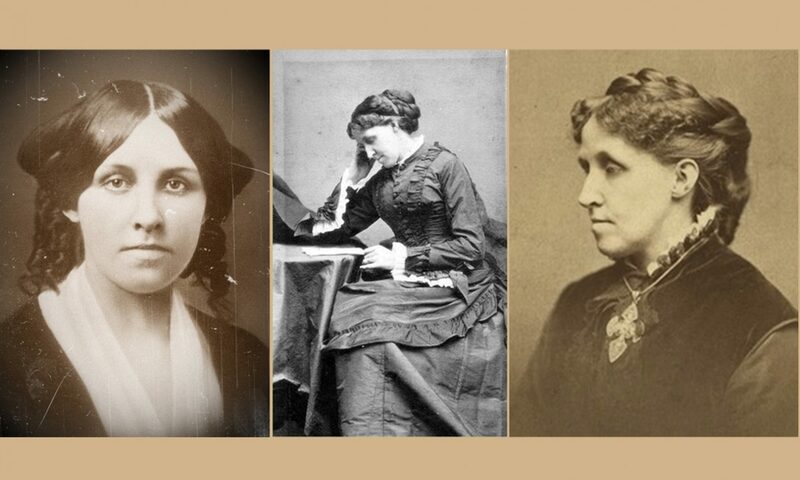 But this would not be the last I would hear from Madelon Bedell – Harriet Reisen, author of Louisa May Alcott The Woman Behind Little Women, got a hold of Bedell’s long lost papers revealing an extensive interview with Lulu Nieriker, daughter of May Alcott. Then came the crème de la crème – Madeleine B. Stern’s Louisa May Alcott. Here, for the first, time, I really felt like I had gotten into the mind and heart of Louisa. When the book ended, it was like saying goodbye (for a time) to a friend. Several years passed before I would binge out again, and that was this summer. Since my last binge, several new books came out including The Lost Summer of Louisa May Alcott by Kelly O’Connor McNees, Louisa May Alcott The Woman Behind Little Women by Harriet Reisen, Eden’s Outcasts: The Story of Louisa May Alcott and Her Father by John Matteson, and 2 books by Daniel Shealy, Little Women Abroad and Alcott in Her Own Time. And there’s even more after that! McNees’ book was the perfect beginning for the binge. Crafted as a quasi-fiction novel based on facts from Louisa’s life, Kelly McNees speculated on a summer in Walpole when Louisa was in her early 20s, considered “lost” to McNees because of the lack of journal entries by Louisa. Did she possibly have a summer romance? Was Laurie from Little Women based on more than her polish boy, Laddie? Here’s one review and here’s another. You can read my take on Harriet Reisen’s book here. I’ve yet to read the other books mentioned, but all in good time. You may ask which book by Louisa is my favorite and you would think it was Little Women. The odd thing was, I tried but never finished Little Women several times. I couldn’t seem to grasp the significance of the book yet I knew it was autobiographical in nature. However, this time, I am reading it for real and am finding it very enjoyable (update–I have read it twice and continue to study it). The first book of Louisa’s that I read was Hospital Sketches and I found that book to be amazing. I have many more lined up to read. It’s about time! I hope you enjoy this blog. I hope to post my own thoughts on what I am reading and I’d love to discuss with with Alcott enthusiasts like you. Please feel free to comment. As a young child I began reading early. My father who was addicted to reading started us on our way by providing us with every book imaginable. I still have the complete series of Louisa May Alcott from my childhood and have maintained a passion for her writing that has lasted throughout my lifetime. I have read every thing I could lay my hands on about her. I just finished Harriet Reisen’s book and found it to be the best yet. Once again I was prompted to reread Little Women but with a different prospective after reading Reisen’s book. I always wanted to be a writer and within the past few years have started to have some stories published in newspapers and magazines. Kelly O’Connor McNees’ book inspired me to try Little Women again and Harriet Reisen’s book fueled the fire to read Hospital Sketches. Now I’m trying out Moods. The cool thing is that many of Alcott’s lesser known works are available in their entirety on Google Books. That’s awesome that you’ve had articles published, congratulations! Good luck in your writing career, and welcome to this blog! Donna, I have been thinking of you today. I was in charge for dinner and I made chicken with cabbage, something I learned years ago and I stick to it whenever I have to cook and don’t want to mess up. For the same reason I made pancakes for dessert. 🙂 It occured to me that you wrote your cookbook by collecting your favorite recipes and making them your own by adding new way and ingredients. I will start trying out your recipes by carrots a l’orange and I’ll let you know how it worked for me. Thank you so much for your cookbook, and your warm inscription and card. I also love your handwriting. Can tell you’re artistic and appreciate beauty in every detail. Today is my lucky day, for I won Harriet Reisen’s book, Louisa May Alcott: The Woman Behind Little Women. The second book this month that will come to my Bosnia’s address all the way from Massachusetts!! I’m so looking forward to reading it! Thank you so much Susan and Harriet, you made me very happy today! Jillien, I’m happy that you came to this blog and into lives of its bloggers. You are sheer blessing and inspiration, wheter you know it or not yet. I am split between Beth and Jo as I have characteristics of both. With Jo, the creative thing along with the bad temper. With Beth, the desire to stay close to home and the spiritual dimension. With Jo it’s who I am and with Beth, who I aspire to be.